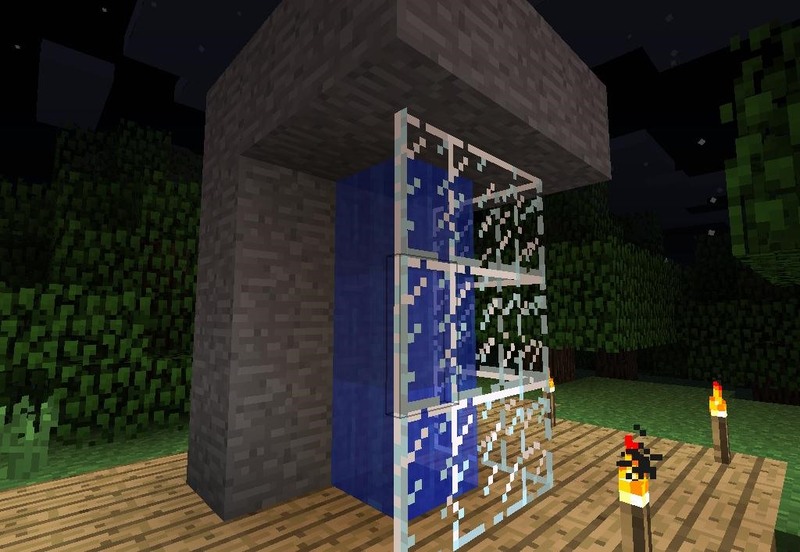 Although Minecraft is a powerful creative tool, it does have limitations. The scarcity of block types and their linear size tends to make the creation of certain detailed objects a challenge. 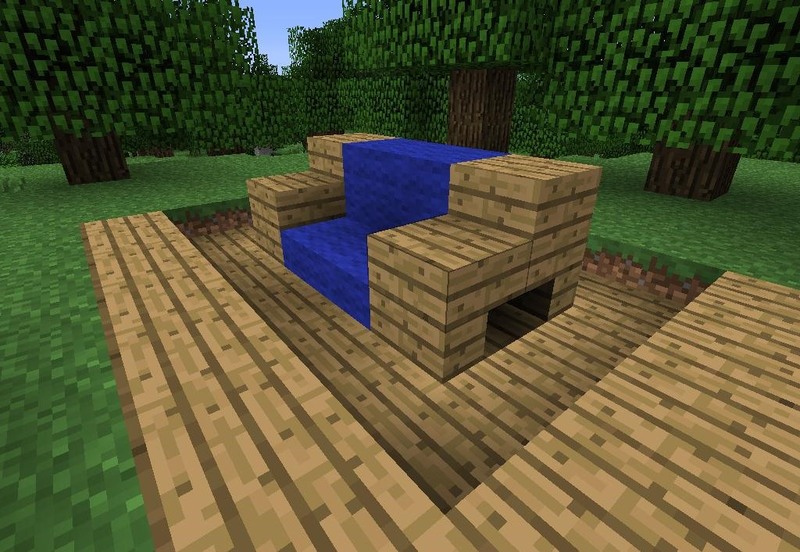 This is especially so with furniture, but there are some easy tricks you can use to make several types of furniture in Minecraft—no texturepacks or mods required. 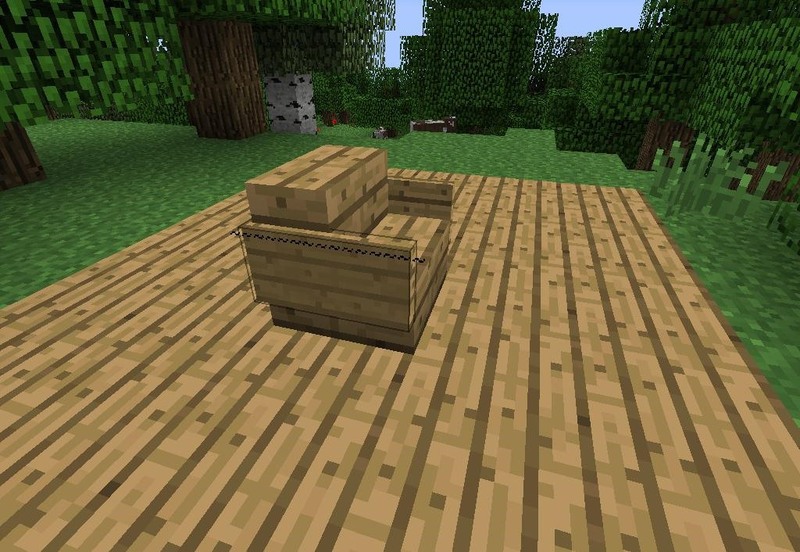 Here's a simple chair made with a wood stair and two signs. Add lettering to the signs for added detail. This stone slab and sign combo makes for a nice simple chair design. 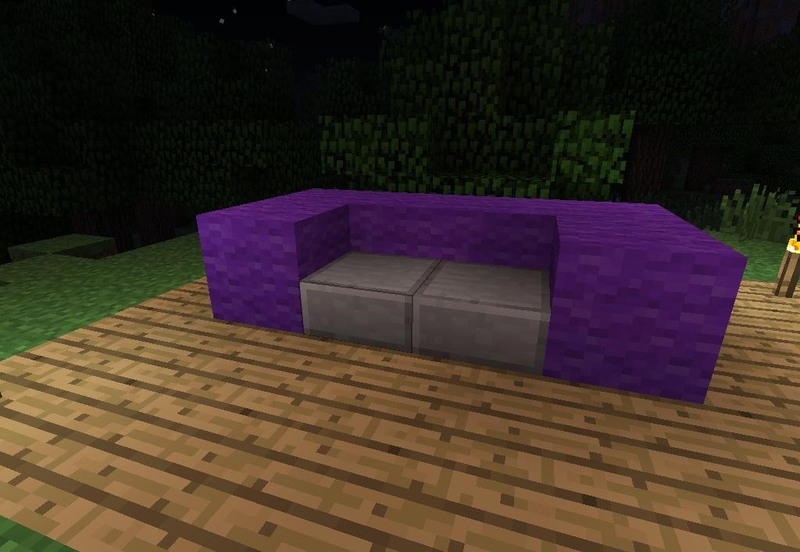 Here I've made a simple sofa with stone slabs and wool. This sofa has legs made from wood stairs. Note the sofa sits on half slabs of wood. Here is a raised table made from a sign post and a wood half-slab. 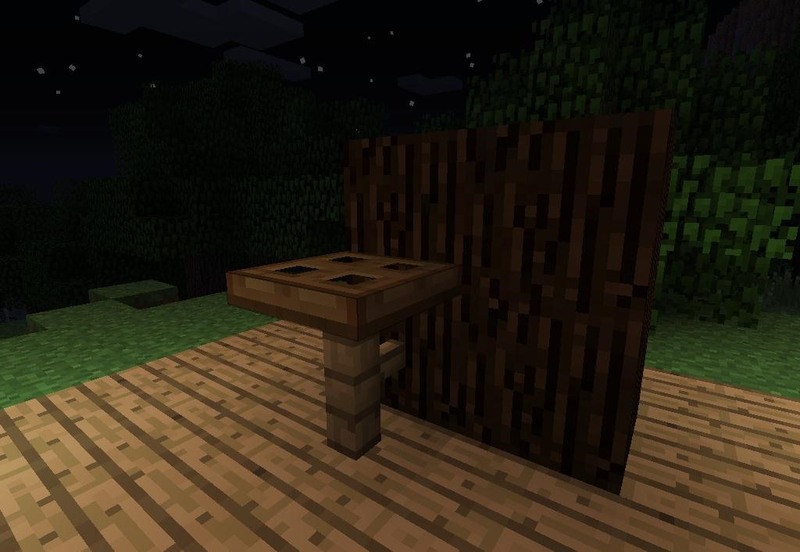 This is a table made from activated pistons, which I placed seating next to for contrast. 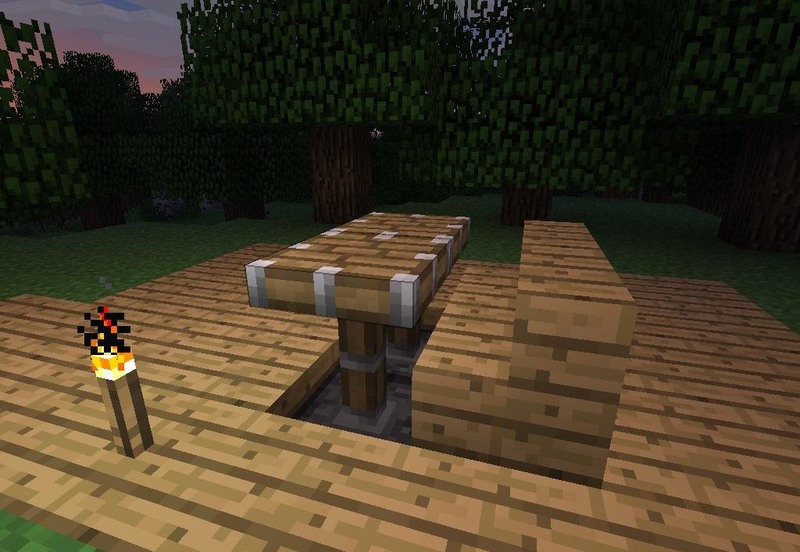 Note that redstone torches sit below the pistons to activate them. 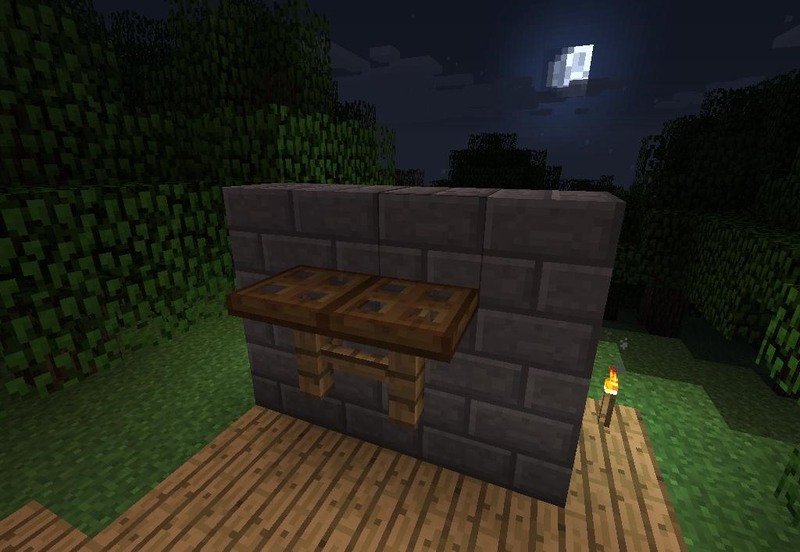 Here is a wall table. This could be used as a desk or island counter. 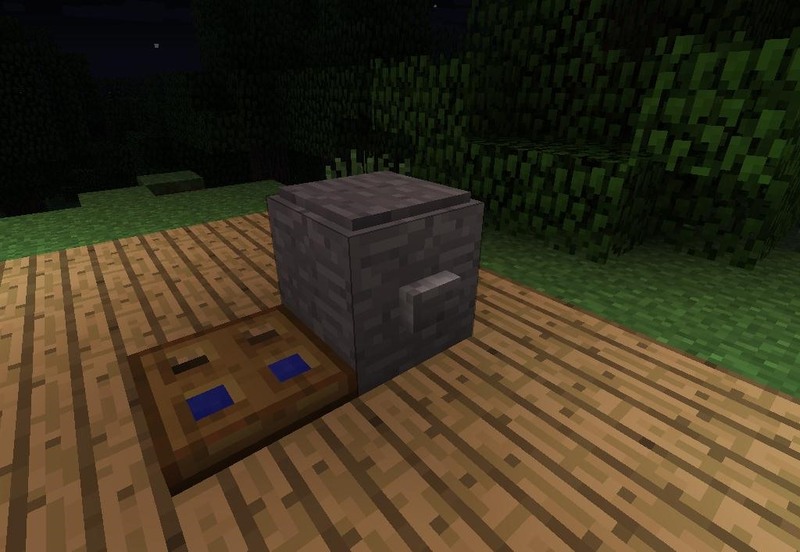 This toilet is made from a stone block, water hole, and trap door. A stone button is added for a handle and a pressure plate as a tank lid. This shower is made from stone and glass pane. 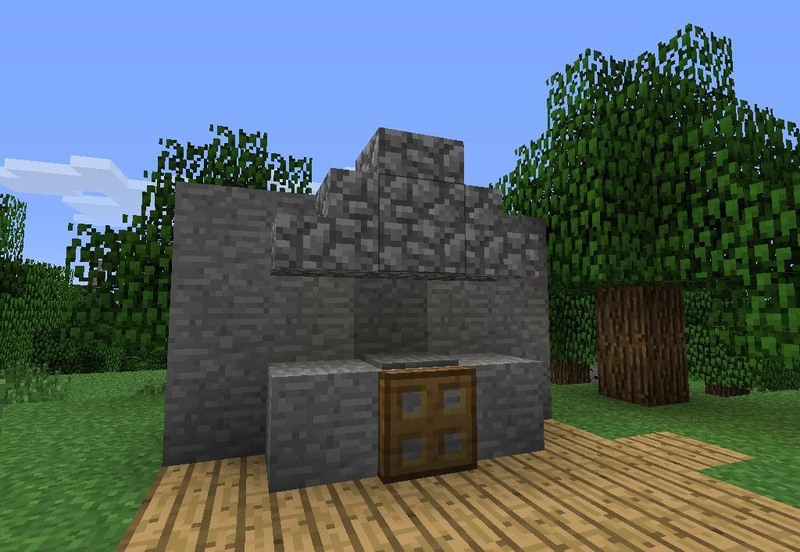 You can easily make it automated with a little bit of redstone. Here a faux wool bed is made more interesting with pressure plates for pillows. 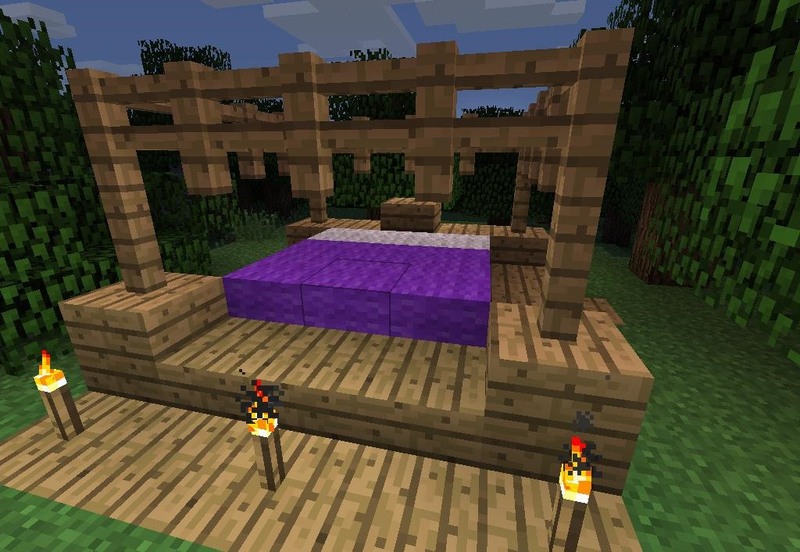 This is a much more elaborate take on a four-post bed. I used fence, half slabs of wood, and wood blocks to achieve this effect. 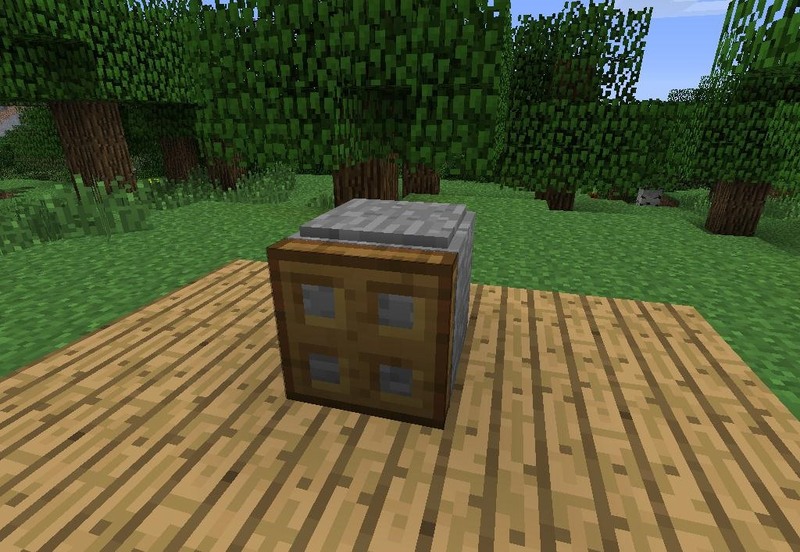 Faux appliances can be made using any blocks that look right to you (in conjunction with pressure plates and trap doors). Counter space is made more believable by varying block types. 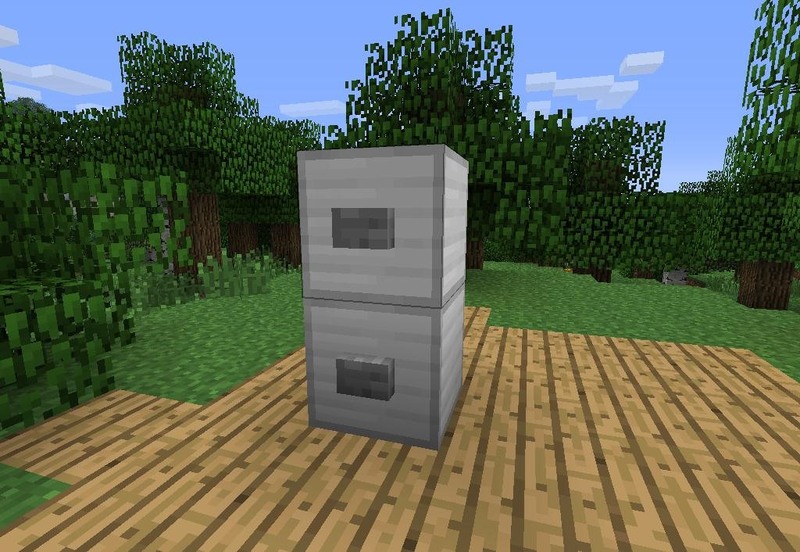 These iron blocks with buttons pose as a fridge. 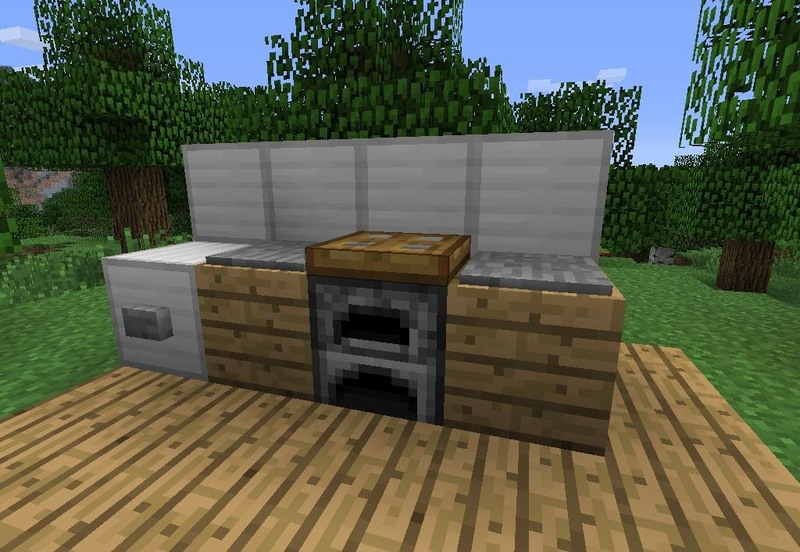 I used cobblestone stairs to create the illusion of a modern oven fan here. 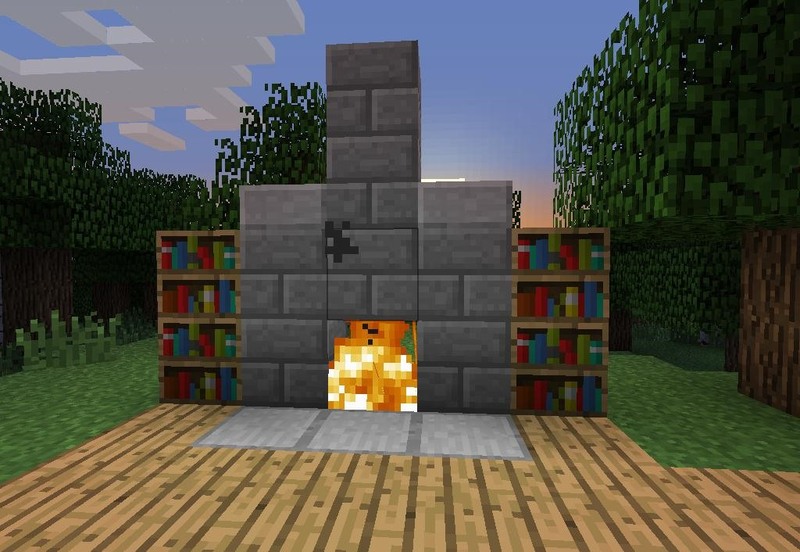 Here an otherwise simple fireplace is made more inviting by the use of stone slabs and bookcases. 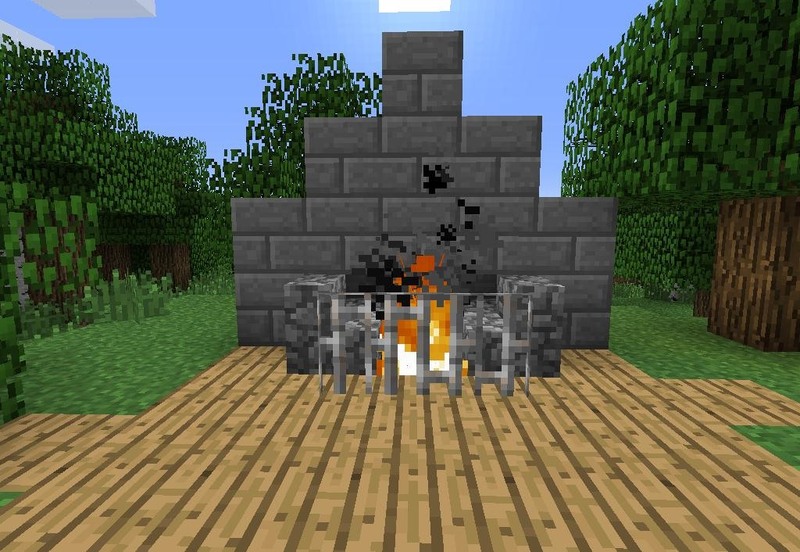 A more traditional look is acheived using iron bars in front of the fire. Here is a built-in shelf. Making furniture is all about using your imagination and making something look believable. If it's believable to you, chances are other people will know what it is. Take your time and try clever tricks. 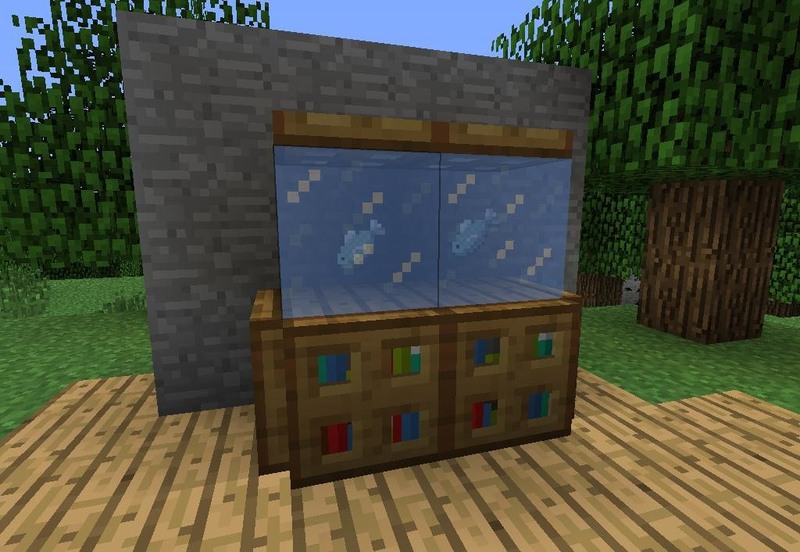 The fish tank is a great example of thinking outside the box, and making clever use of block types. 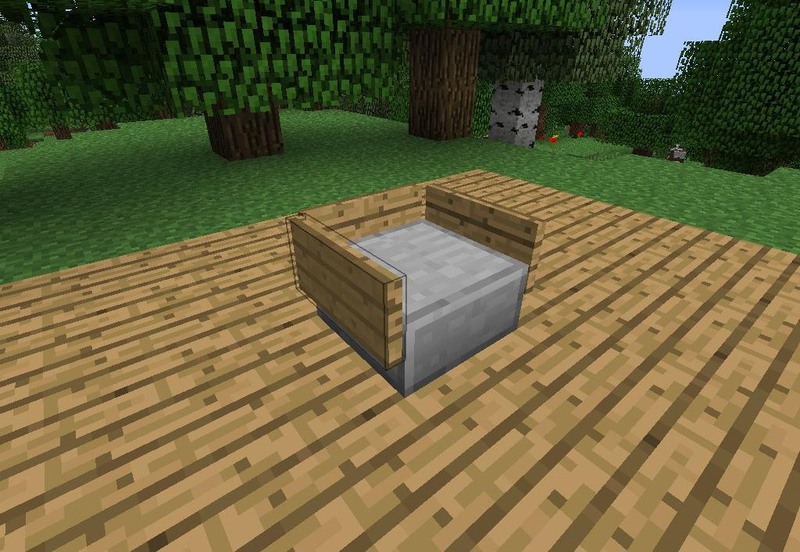 This, after all, is the key to making furniture: using blocks in a way they were never intended. Do the fish stay forever? i thought that items disappear after 5 minutes, did they change this? It really depends how far you are from the items. If you are out of rendering site of them, 15 minutes is a good estimate, but they may not disappear if you're near enough to them. Good point, I'll add those in there. It is you who are amazing. I love the enthusiasm, see you on the server! Hey this is really helpful, if anyone has any more ideas please try to contact me on this wiki. Question: I made a fish tank. I used diamond ore on bottom and placed the fish on top, then placed the ice block. 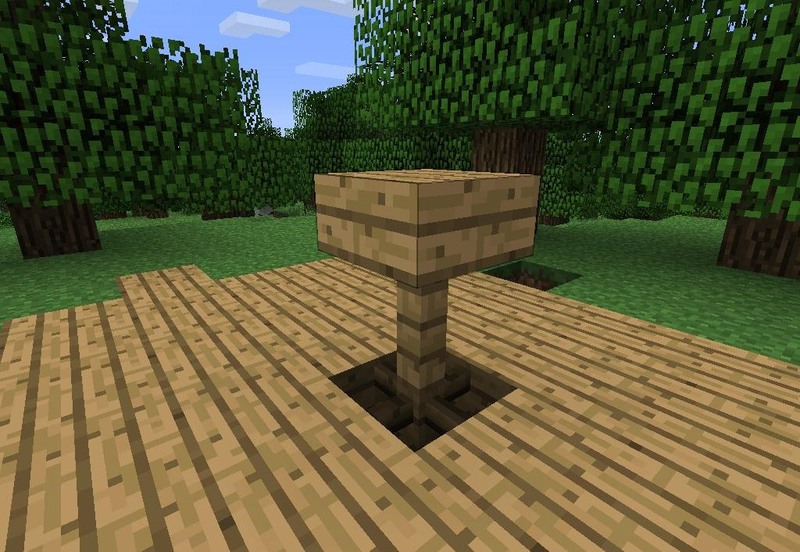 I tried various things on top...trap door, slabs, wood blocks, etc. But the fish keep popping up out of the ice after a couple seconds, no matter what I use. What am I doing wrong? Is this server cracked? I dont have a job yet and i only play cracked! That fish tank is cool, I never thought of that before. For the Fire pit my house if made out of most from wood and keeps catching on fire, how do I stop that from happening. 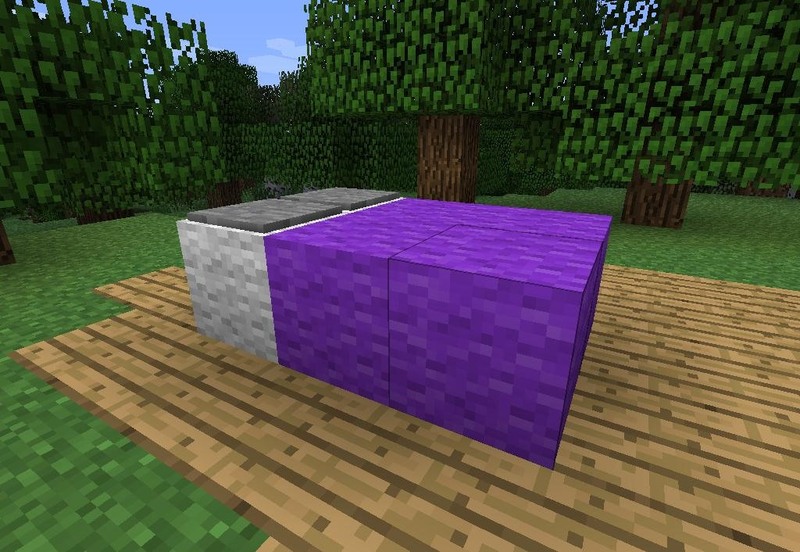 how about make netherrack at the bottom and a cement block behind and a cement slab in front! If you're playing in a world that you've created you can turn off fire spreads in the game options prior to load out. very insightful, thanks. great stuff keep it coming. Is this for PC only? I tried on Xbox one and this fish slide right out.